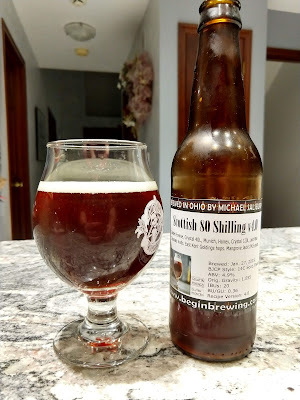 I have long been a fan of the more malt-forward styles of beer, and the Scottish 80 Shilling Ale (also known as the Scottish Export Ale) is no exception. The roasty and toasty, caramel, and dark fruit flavors of the malt combine with just enough hop bitterness to bring the beer to a perfect balance. The 80 Shilling is a stronger version of the Export Ale, meant to have enough alcohol to stand transatlantic voyages. I've made three Scottish Ale versions before this. The first version fared poorly in competition, scoring an average of 27 out of 50. The second, to me, was much better. The judges disagreed, scoring it 25.5. The third never made it to competition, so I don't know how it would have scored. To me, it was the best of the three. This, the fourth version, is actually a recipe from Jamil Zainasheff and John Palmer's book Brewing Classic Styles. The recipe in the book scales between a 60, 70, or 80 Shilling Ale. According to the authors, the difference between a 60, 70, and 80 Shilling ale is the amount of base malt. You only change the specialty malt percentages, they say, if you're increasing or decreasing the volume of beer. It makes sense to me, but it's the first I'd heard that. After the boil, the Brewie+ was told to chill the wort to 64F. 01/26/2019: The Brewie performed flawlessly on this one, with no errors or other issues. The wort chilled to 64F easily. The wort volume as delivered into the fermenter was above 2.5 gallons and the gravity came in at 1.060 SG. I added distilled water to bring that back down to 1.055 SG, which resulted in a volume of just under 2.75 gallons. Clarity Ferm and the Mangrove Jack's yeast were added, then the temperature control system was set to keep the fermentation at 69F, which is roughly the middle of the range for the yeast. 01/27/2019: Gravity has dropped from 1.055 SG to 1.025 SG over the past 24 hours. Temperature has held at 67F. That's approximately 53% attenuation. 01/28/2019: Gravity has dropped from 1.020 SG to 1.020 SG. This is 63.6% attenuation. 01/29/2019: Gravity is holding at 1.020 SG. This is well above the expected 1.012 SG. The 63.6% attenuation is well below the yeast's reported 70-75% rating. 02/03/2019: A half-teaspoon of gelatin was bloomed, heated to 155F, and added to the beer. The mini-fridge was busy, so I moved the beer outside. Unfortunately, current outdoor temperatures are expected to range between 15F and 60F over the next week, so I don't know how much clarity I'm going to get out of it. 02/05/2019: The beer is currently registering 1.018 SG (6 points higher than the originally-estimated final gravity from BeerSmith) and 45F. Our current outside temperature is reported to be 40F, which is almost as low as it's expected to get overnight (the forecast calls for a low of 39F). 02/09/2019: The beer has been left in an insulated container outside with a heating element to keep it from freezing (but let it get as close as possible to ensure clarity). With our warm temperatures in Central Ohio this week, the beer has been in the mid-to-upper 40F range, but today has dropped down to 23F. I've got the temperature control system holding it close to this figure to allow the gelatin to do its thing before bottling. When I bring this fermenter in for bottling, I'll take out the Irish Red or Dark Mild to allow those to clarify as well. 02/12/2019: The beer is currently registering 1.018 SG (which it has for over a week now) and a temperature of 43F (though it's been as low as 25F since it went outside). The beer was bottled with four small carbonation tablets (medium carbonation). Yield was 27 twelve-ounce bottles. A taste of the beer from the final few ounces in the fermenter was very good. I'm looking forward to tasting the finished version with some carbonation.